Audrey Dalton will be signing autographs at the Los Angeles Comic Book and Science Fiction Convention on Sunday, May 6, 2012. 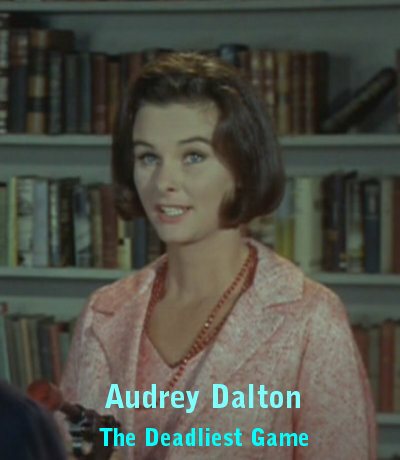 Audrey starred as Dr. Lydia Parrish in a season two, episode seven Voyage to the Bottom of the Sea titled The Deadliest Game. This will be Audrey Dalton’s first and only west coast signing appearance. Audrey will be signing from 12:00 P.M.-2:00 P.M. Some of the other Television series Audrey has starred in are Boris Karloff’s Thriller, The Wild, Wild West, The Girl From UNCLE, Wagon Train, and Bat Masterson. Audrey starred in Classic Horror Movies William Castle’s Mr. Sardonicus and The Monster That Challenged the World. And Audrey starred in the Movie Titanic (with Clifton Webb, Barbara Stanwyck, and Robert Wagner), one of the first movies to cover this subject. Other Guests appearing will be Barbara Leigh (the First Vampirella Warren Magazine Model), Ian Ogilvy (The Saint in The Return of the Saint TV Series, star of Classic Horror Movies Witchfinder General, From Beyond The Grave), Kathryn Leigh Scott and Lara Parker (stars of the original Dark Shadows TV Series), Ann Robinson (star of George Pal’s War of the Worlds, Rocky Jones, Space Ranger TV series), and Georges Jeanty (Artist for Buffy the Vampire Slayer Comic Book). The May 6, 2012 Los Angeles Comic Book and Science Fiction Convention will be held at the Shrine Auditorium Expo Center, 700 West 32nd Street, in Los Angeles, CA (across from USC College). Admission is $8.00, five years and under are free. Show Hours: 10:00 A.M.-5:00 P.M. The Dealers Room features over one hundred tables of Comic Books, Toys, Trading Cards, DVDs, and many other Collectibles. Show Hours are 10:00 A.M.-5:00 P.M. Check www.comicbookscifi.com for more information. Posted on Saturday, 7th April 2012 at 1:00 am	in Events, Voyage to the Bottom of the Sea.